DENVER, March 22, 2015 — Chlorine, a disinfectant commonly used in most wastewater treatment plants, may be failing to completely eliminate pharmaceuticals from wastes. As a result, trace levels of these substances get discharged from the plants to the nation’s waterways. And now, scientists are reporting preliminary studies that show chlorine treatment may encourage the formation of new, unknown antibiotics that could also enter the environment, potentially contributing to the growing problem of antibiotic resistance. The research, which will be presented today at the 249th National Meeting & Exposition of the American Chemical Society (ACS), suggests that a re-evaluation of wastewater treatment and disinfection practices is needed. The ACS is the world’s largest scientific society. The national meeting, which takes place here through Thursday, features nearly 11,000 presentations on a wide range of science topics. “Pharmaceuticals that get out into the environment can harm aquatic life, making them react slowly in the wild and disrupting their hormone systems,” notes Olya Keen, Ph.D. She adds that increased antibiotic exposure, even at low levels in the environment, can lead to development of antibiotic-resistant microbes and a general weakening of antibiotics’ abilities to fight bacterial infections in humans. But besides failing to remove all drugs from wastewater, sewage treatment facilities using chlorine may have the unintended consequences of encouraging the formation of other antibiotics in the discharged water. 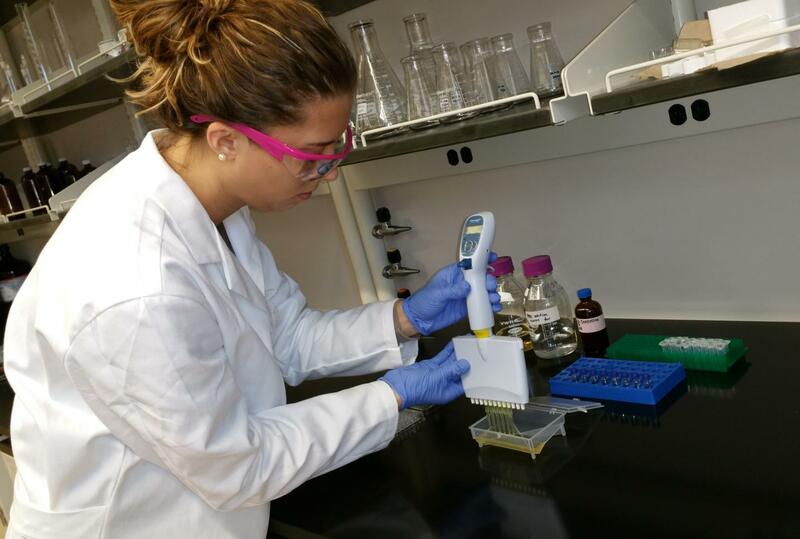 Keen, graduate student Nicole Kennedy and others in her team at the University of North Carolina at Charlotte ran several lab experiments and found that exposing doxycycline, a common antibiotic, to chlorine in wastewater increased the antibiotic properties of their samples. “Surprisingly, we found that the products formed in the lab sample were even stronger antibiotics than doxycycline, the parent and starting compound,” she adds. Keen has not yet identified all the properties of these “transformation products,” and that research is now underway. She notes that these compounds could turn out to be previously unidentified antibiotics. Keen explains that the best solution may be to decrease the amount of these drugs that reach a treatment plant in the first place. Currently, disposal of pharmaceuticals is not regulated, however. So she urges a greater emphasis on collecting and incinerating old pharmaceuticals, rather than dumping them down the drain or placing them in the trash, which can lead to harmful environmental exposures. In addition, this research has applications to drinking water treatment systems, most of which also use chlorine as a disinfectant, she says. To purify drinking water, chlorine must remain in the distribution piping system for hours, which blocks microbes from growing. But this also provides ample time for chlorine to interact with pharmaceuticals that may be in the water, encouraging development of new antibiotic compounds. A press conference on this topic will be held Monday, March 23, at 10:30 a.m. Mountain time in the Colorado Convention Center. Reporters may check-in at Room 104 in person, or watch live on YouTube http://bit.ly/ACSLiveDenver. To ask questions, sign in with a Google account. Keen acknowledges funding from the University of North Carolina at Charlotte and the National Science Foundation. Pharmaceutical contaminants found in the environment have been of interest to researchers for decades due in part to their effects on the environment and implications for human health. Treated wastewater effluent is the main source of these contaminants in the environment. Typical wastewater disinfection processes such as UV, ozonation and chlorination have been effective in decreasing the concentrations of pharmaceutical contaminants in treated wastewater. In the past, the effectiveness of chemical treatment processes was examined based on the disappearance of the parent compound. Recently, transformation products have been gaining more attention and have been evaluated in several studies by either identifying the structures of the products that form or by tracking changes in the properties of the transformation products compared to the parent compound. The properties of transformation products of pharmaceuticals during chlorination of wastewater have not received sufficient attention in research despite chlorination being a predominant method of disinfection for both drinking water and wastewater. The research to be presented examines the transformation of doxycycline – a common pharmaceutical pollutant in wastewater effluents and the environment. The study evaluated the changes in the antibacterial activity of the products that form in the reaction between doxycycline and chlorine using antibiotic resistance assays. The results showed that some of the transformation products have antibiotic properties. The products of chlorination were also examined with HPLC-MS and several chlorinated products were detected. These transformation products may still select for antibiotic resistant micro-organisms in the environment even in the absence of the parent doxycycline molecule. This suggests that re-evaluation of wastewater disinfection practices may be needed.